Luke Cage season 2 is coming up next in the Marvel Netflix universe saga, and today we have a new image from the upcoming season that will give Marvel fans a thrill. 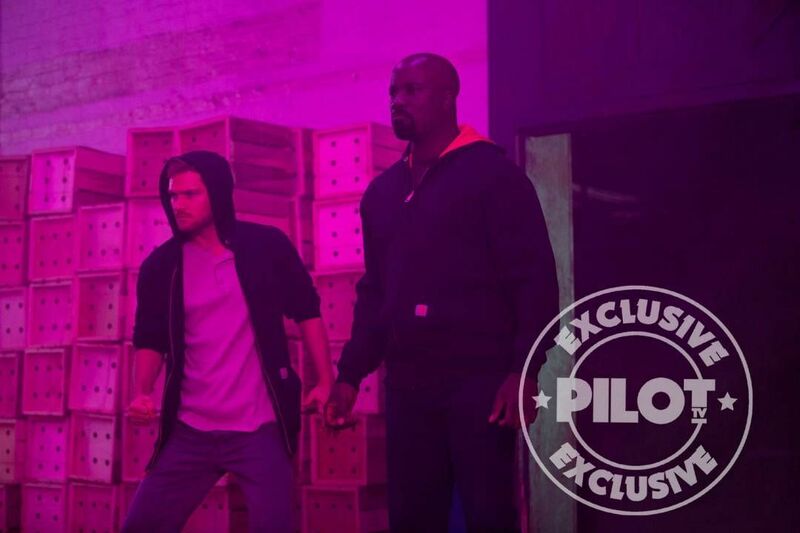 We finally get to see our two favorite Heroes for Hire (Luke Cage and Iron Fist) standing together in battle! Empire revealed the exclusive image as part of a report on Luke Cage season 2's storyline - and it has a very Jessica Jones Kilgrave theme to its coloring, no? Can't wait to see what that's about. In this new season, Luke will be a free man now working openly as a hero of Harlem, while maintaining his relationship with Claire Temple (Rosario Dawson). A new villain (or rather, villainess) will rise in the form of Marvel Comics mobster princess Rosalie Carbone, who will be played by The Sopranos' Annabella Sciorra. Carbone will reportedly be, "a dangerous downtown criminal underworld power player with an eye, and an agenda, toward Harlem," which already has fans speculating whether she'll be in league or conflict with Alfre Woodard's Black Mariah, who rose to power as a crime boss at the end of season 1. As for Iron Fist: apparently Danny Rand's "brief" appearance in season 2 won't just be a fan-service team-up for a brief mission; Danny will actually be teaching Luke a thing or two. According to showrunner Cheo Hodari Coker: "Danny helps Luke channel his chi," which will presumably help Luke develop the ue of his powers into a much more effective form of combat offense and defense. Should be interesting to see how Luke and Danny do in the student / teacher format. The banter alone will probably be gold. Check out the first photos of Luke and Danny sparring here. Another big Marvel milestone expected in Luke Cage season 2 is Simone Messick's Misty Knight getting the iconic bionic arm she wears in the comics. Misty was critically injured during The Defenders' fight with The Hand, but with her bionic arm, and a budding friendship with Colleen Wing, the complete Heroes for Hire set is about to be complete. Luke Cage season 2 debuts on Netflix on June 22nd.